Fox News and a black political group say they will not hold a Sept. 23 Democratic presidential debate in Detroit, which the leading candidates already were planning to skip. A new date had not yet been set, Fox News spokesman Michael Murphy said Thursday. The campaigns of U.S. Sens. 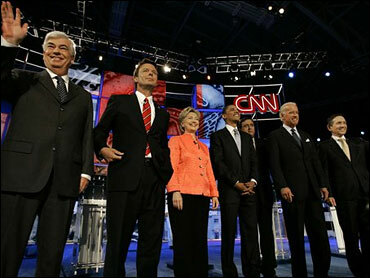 Hillary Rodham Clinton and Barack Obama and former Sen. John Edwards had said they would not participate in the debate. Opponents have criticized Fox as biased against Democrats. The debate, co-sponsored by the Congressional Black Caucus Political Education and Leadership Institute, was to have been held at the Fox Theatre. Institute chairman U.S. Rep. Bennie Thompson, D-Miss., said in a statement on the group's Web site that the "overwhelming number of party presidential debates has created a scheduling challenge." "Revisiting the CBC Institute's debate schedule will allow the time necessary to complete all debate logistics in an effective manner," he said. The group had said it planned to sponsor two Democratic and two Republican presidential debates.